Founded by Samuel Pritchard Matheson in 1901 as a place specifically for the higher education of girls, Havergal College (also known as Havergal Ladies’ College) was located in the 1882 Carlton Street residence of Albert William Austin. Initially opened as a residential and day school, enrollment quickly necessitated expansion. A large addition to the original structure was started in 1902 and completed the following year by the Manitoba Construction Company. 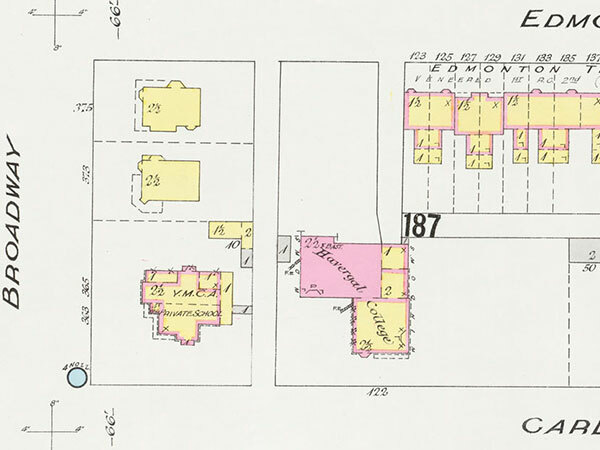 In 1904, the adjacent property on Edmonton Avenue was purchased from the Hudson’s Bay Company for use of Physical Culture [Physical Education] classes such as field, court, and rink sports. A further accommodation increase occurred in 1905-1906. In 1915, the school renamed to the Rupert’s Land Girls’ School as to avoid confusion with the Havergal School at Toronto, Ontario, and it was incorporated with St. John’s College. Grades were expanded to include K-12, with core English and mathematics courses augmented with religious education, home economics, arts, languages (French, German, and Latin) music, handicrafts, physical training, dancing, botany, drawing, and others. In 1950, the school was amalgamated with the Riverbend School for Girls to form the Balmoral Hall School for Girls. After 1954, the site was vacated and the facility was used as an armoury and mess hall by the Royal Canadian Air Force No. 17 Wing Auxiliary. 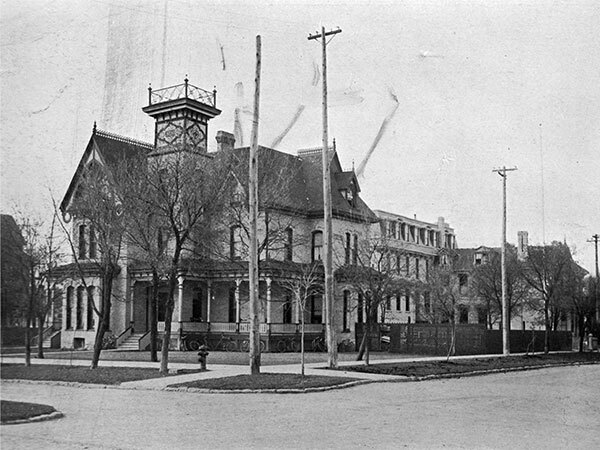 In the spring of 1964, the building was demolished to make way for a provincial government parking lot. At a special ceremony attended by Balmoral Hall board member Ian Jessiman, Balmoral Hall teacher Beverly Sharman, Principal Gwendolyn Murrell-Wright, RCAF 17 Auxiliary Wing Commander John Klaponski, and Superintendent of Manitoba Government Buildings Robert Gemmel, the building’s 1902 expansion cornerstone time capsule was opened. Inside was a copy of a 1902 Manitoba Free Press, Havergal College pupils list, and assorted artifacts. The 1902 cornerstone was saved by the school. The site remained a surface parking lot until the 2013-2014 expansion of the Winnipeg Convention Centre. Among the teachers were Miss Wilson (1902-1903, French), Miss Mirus (1902-1903, Cooking and Domestic Science), Edith McLean (1903-?, Principal of Kindergarten), Agnes Dalton (?-1903), Miss Meyers (?-1903, German and Domestic Science, 1903-? Superintendent of House-Keeping), Miss Adams (1903-? ), Miss Chisholm BA (1906-? ), Miss Preston (1906-? ), Margaret Dorothea Rowbotham (1914-1916), Violet Short (1928-?, Arts Department Head), Kathleen Schoenau (1928-?, History and Junior Mathematics), Lillian Welch (1928-?, Greek, Rythmic Character, National Dance, and Clocution), Gwendolyn “Gwen” Jones (1928-?, Kindergarten), Miss Pearman (1928-?, English, Literature and Drama), Miss Sheldon (1928-?, French), Miss Shelford (1928-?, Advanced Mathematics), Miss Bannister BSc (1928-?, Chemistry), Miss M. Davis (1928-?, Classics [English exchange teacher]), Stella Boyd (1928-?, Vocal Training and Music), Gladys E. Millard (1928-?, Science Department Head), Elsie M. Bartlett (1930-1935, Drama and Music), and Henrietta B. Herkes (1938-c1943, Mathematics). Source: Archives of Manitoba, Winnipeg - Schools - Havergal College 2. Source: “Rupert’s Land Girls’ School,” Winnipeg Tribune, 27 August 1938, page 10. Source: Library and Archives Canada, Insurance Plan of the City of Winnipeg, Manitoba, Canada, Volume 1, Sheet No. 40, August 1906. “Havergal College,” Winnipeg Tribune, 4 October 1902, page 4. “Havergal College,” Winnipeg Tribune, 3 January 1903, page 1. “Havergal staff,” Winnipeg Tribune, 20 June 1903, page 2. “Havergal opens,” Winnipeg Tribune, 9 September 1903, page 10. “The Manitoba Construction Company,” Winnipeg Tribune, 19 December 1903, page 20. 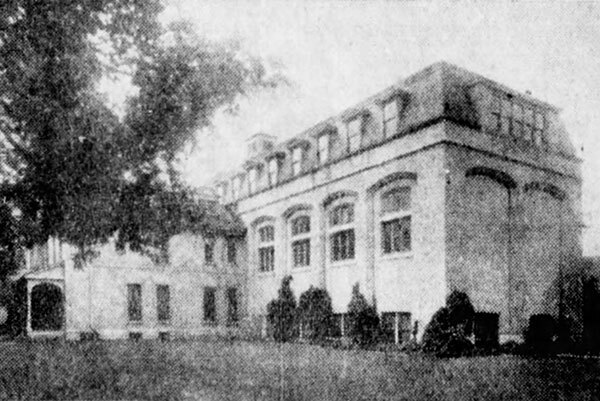 “Havergal College,” Winnipeg Tribune, 12 September 1906, page 5. “Havergal College,” Winnipeg Tribune, 15 September 1906, page 11. “Havergal College Winnipeg,” Winnipeg Tribune, 28 December 1906, page 2. “Changes in faculty at Ladies’ College,” Winnipeg Free Press, 19 September 1928, page 9. “Miss Millard Principal of Ladies’ College,” Winnipeg Tribune, 12 October 1928, page 2. “Stories houses tell” by Lillian Gibbons, Winnipeg Evening Tribune, 9 November 1935, page 12. “Alterations carried out during summer will add to facilities at Rupert’s Land,” Winnipeg Tribune, 28 August 1937, page 17. “Rupert’s Land Girls’ School,” Winnipeg Tribune, 27 August 1938, page 10. “Rupert’s Land Girls’ School,” Winnipeg Tribune, 19 August 1939, page 6. “Director of Volunteers named by White Cross Guild,” Winnipeg Tribune, 26 October 1948, page 10. [Photo caption], Winnipeg Free Press, 11 June 1964, page 13. We thank Nina Baker and Susan Bracken for providing additional information used here.